But then spring fever hit me! The sultry perfume of the Russian olive trees wafting through the air, the emergence of flowers, leaves on trees, the warm breezes in the afternoon and the sharp smell of a light sprinkle of rain on an otherwise dry New Mexico day. No really! Chocolate Mousse with dates as the sweetener. And tofu. You can’t get more veganiciously romantic than that! And guess what? This is by far the simplest and fastest mousse yet! And as a bonus–there will be hardly anything to wash afterwards! The only caveat will be . . . . How will it taste? I mean, this is a pretty dramatically different mousse recipie—tofu as a base and dates as the sweetener! I went to a favorite standby website for the recipe, Christina Cooks.com, for her incredibly simple recipe. There are just four ingredients: silken tofu, 100% cocoa powder, medjool dates and pure vanilla extract—plus I added a little cinnamon. You blend it all up and you’ve got yourself a dreamy, creamy chocolate mousse and only one blender or food processor to wash! Mine came out way too thick at first and I added more tofu to get the right consistency. I would suggest having an extra container of silken tofu around just in case. When I added the extra tofu, everything blended up nicely. However the extra tofu reduced the proportion of cocoa and the outcome was a little less chocolatey than usual. I’m going to have to work on that adjustment. 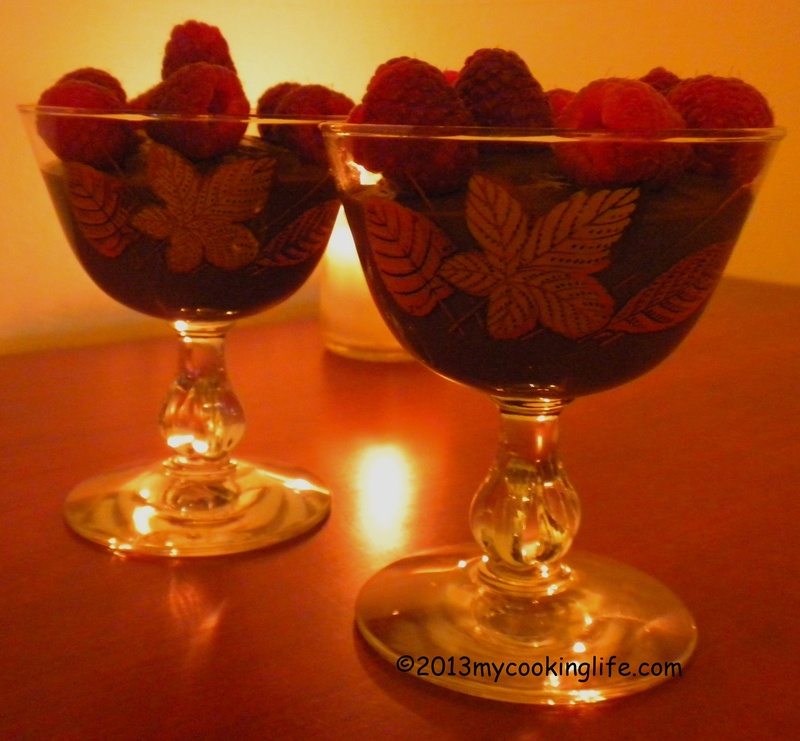 I decked our mousse out with some raspberries and lit a romantic, naturally scented candle. Ooooo La La! A Date with Chocolate! A candlelit date with – sigh – chocolate! How romantical can you get? This entry was posted in Chocolate, Mousse, Vegan and tagged Chocolate Mousse, Christina Cooks.com, how to use cocoa, tofu dessert, vegan mousse, veganicious by mycookinglifebypatty. Bookmark the permalink. You know, that’s such a good idea. To make a date with chocolate! And to pair it with tofu. I think I’ve seen this recipe by Christina. By the way, always love reading your writing. Thanks Kathy! I really liked the recipe and it tasted really good. Just not quite like honest-to-god chocolate mousse. Nice of you to let me know you’re enjoying the writing. That kind of compliment could keep me going for months! First of all, I love mousse, let’s get that out of the way.I am not a vegan, but I am always open to vegan recipes, meatless recipes, etc.This is so interesting! I will have to look around your site much more. Thank you so much Tonette! Not all my mousses have been vegan in fact this is the first one.